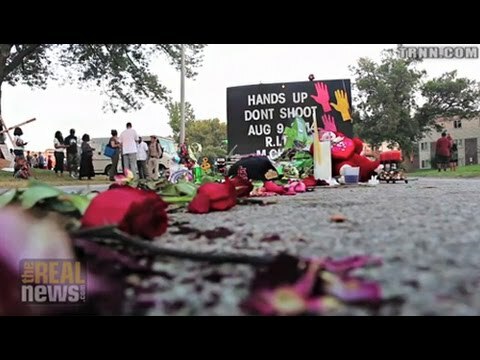 JIHAN HAFIZ, PRODUCER: On the ground in Ferguson, Missouri, The Real News speaks to local residents about the killing of teenager Michael Brown by police officer Darren Wilson and how the incident has transformed their lives. UNIDENTIFIED 1: We can just put it right here. UNIDENTIFIED 1: [incompr.] leave it [incompr.] just put it right here. UNIDENTIFIED 3: Psalms 91 said, he who dwells in the shelter of the most high will rest in the shelter of the almighty. [snip] he also called. Those he called he also justified. [snip] Fools do not understand that though the wicked spring up like grass and all evildoers flourish, they will be forever destroyed. LA’SHELL, FERGUSON RESIDENT: They said that this young man had to lose his life for it to be nationally known. And like I said, we just want justice, not just in St. Louis or in St. Louis County, in Florissant; just all over. We’re just for positivity and justice. CAMERON, FERGUSON RESIDENT: Yeah, first time I’ve seen everybody come together like this, that’s for sure. There’s a lot of people out here. People now are giving free food, all of that. There’s a whole bunch of people coming through right now, bikers and everybody just coming through. You know what I’m saying? There’s always a whole bunch of people out here. The thing is, we need to just come together. You know what I’m saying? Don’t let this slide off. We’re going to be out here every day until we get justice. And it’s just like that. JOHN BONDS, FERGUSON RESIDENT: I know I’m down to–I’VE probably got three packs of funds left. Okay. And we’re taking donations. I’m from St. Louis. I’m out here representing the Mike Brown generation and my generation. We’re showing unity right now. It’s been a long, tough week for everyone. Every day, I’m coming out here and supporting. I’m giving free food away, free hot dogs. We’re taking donations from people to keep it going. We’re getting church groups donating bread and water and ice and sodas and Gatorade, Pampers. They’re coming out. They’re registering people to vote. It’s a community movement. And this is such a beautiful thing. [snip] All that money they spent on overtime–and all those police are still getting overtime and hazard pay. For all that money they’re giving them–. We can step over here, ’cause I know it’s smoky a little bit. For all that money that they’re giving the police officers to stand around waiting on something to maybe happen, [it] could be spent giving these people jobs. These people want to work. You know, there’s a big old myth that we’re lazy and we don’t want to work. That’s not true. We don’t want to be on welfare. We don’t want to be on food stamps. We don’t want to be harassed by the police, either. We need the resources. We need somebody to come talk to us, connect with us, find out what our individual needs are, and help us develop the programs to where we can make sure that the money don’t go to somebody who already got it and they’re just paying their house loan down with it and car loan with it and maybe help one or two brothers and not help the rest of them. We need to try to do something to help all of them. And if we don’t do that as a society, it’s going to be your city next. Soon as you take that away, and then you oppress us with the police on top of it, have us all in court paying fines–. I don’t have a job. What do I look like? How am I supposed to pay for all these traffic tickets? I drive between this place in my house. I live ten, maybe five miles from here. Between this place in my house, I’m going to go through about ten different jurisdictions. I can get ten different tickets on the way home. You know what I’m saying? And if I don’t pay for them, they’re going to lock me up. You could be locked up for 30 days on a traffic ticket. You know what I’m saying? You lose your job, you lose your family, you lose your apartment. And we understand that people need to do things to let lift themselves up. But don’t stack the deck against me and then tell me to lift myself up from my bootstraps. That’s not genuine. They’re waiting on something that ain’t going to happen. when they could give–but they’re telling us they ain’t got no money. That’s a lie. They sure have found it for them police, didn’t they? UNIDENTIFIED 4: Thank you, brother. I appreciate it. I love the way you’re talking to. You’re telling it like it is. CAMERON: [incompr.] police patrolling their own neighborhoods. If you ain’t grow up over here, you don’t need to patrol over here. Flat out, if you don’t live over here, you don’t need to patrol over here, ’cause that’s how racial profiling starts right there. You know what I’m saying? You ain’t from over here, you just see some [little (?)] dude–you say they just killed an honor roll student. You know what I’m saying? Racial profiling right there. Whoever they–they’re going to pick whoever to be in there who they want to be in there. It don’t matter about nobody voting or nothing. Yeah, it mattered back then and people marched for it back then, but that ain’t this time or day. You know what I’m saying? So that ain’t–voting mean nothing. You know what I’m saying? Especially if they’ve got that mechanical voting thing in there. They just don’t lie, say it was this tally against this tally. You know what I’m saying? So it don’t matter. If your votes ain’t straight going into a box with a piece of paper on it, it don’t matter. COWBOY, OUTCAST MOTORCYCLE CLUB (ST. LOUIS): My name’s Cowboy. I’m from St. Louis, Missouri. I represent Outcast Motorcycle Club, the oldest all-black motorcycle club in the world. We’re out here in Ferguson showing our support. So racial discrimination is a must, need to be addressed. You know? And this ain’t the first time. This stuff happens, you got politicized. You know? If you shoot a person like this–I don’t care what color. He was a human being. So they shoot him down like he was something that you was hunting. That’s totally inhumane. And I find it disgusting that he’s not locked up or wasn’t locked up at the time of the incident. What needs to be done first of all: these police, they need to be interviewed, they need to be studied, you know, their [character (?)]. They need to be dealt with on any incidents they have. This community here is predominantly black, but there’s not predominantly black officer patrolling this area. They came to this area, they blocked the streets off, so you’ve got one way in and one way out. It’s like they’re trying to cage this environment in. This is like a prison. Voting is very central to the community for the future generations to come. KEVIN, ST. LOUIS RESIDENT: So I wanted to come and show you, so that one day, hopefully, justice is served. And justice means that if you did something wrong, that just like anybody else, he should suffer the consequences. You remember, Daddy always tell you, there’s consequences for what? KEVIN’S SON: For your actions. KEVIN: I can’t hear you. KEVIN: For every action there’s consequences, right? I just came out to pay my respect and just to see firsthand what happened and to show my children what happened, just so that they can experience it and hopefully that they can learn through this. Son, have you been seeing this on TV or hearing it on the radio or anything? KEVIN’S SON: I heard it on the radio. KEVIN: So he’s heard it on the radio. And I don’t want him to just–him to continue to just hear it and not really be familiar with what’s going on. So I wanted to give him the opportunity to witness it firsthand so that he can have a little bit better understanding, so that when he grows up, that hopefully he can be a part of helping change or helping to inspire change. What I see is unity at this time. I see a lot of people coming together just to kind of bring light and shed light on the situation, just so that people across the globe and here in St. Louis and in Missouri can kind of identify with the issues that are going on. You know, it’s unfortunate. I have, obviously, a young son. He’s African-American. And I do fear that one day this type of thing could happen to him. I personally have been through different situations as to where I felt like I was targeted because of the color of my skin by the police. And I just feel like that I pray one day for a change, and that I feel like the only way that change is going to come is if we educate the young people. This is a perfect example. This right here is my fiancée and my daughter. We are a family. So I feel like Camille, say hi, baby. So I feel like–. Camille [spl? ], say hi, baby. So I feel like the police should be policed better, and I feel like they should abide by a different set of rules other than the ones that they’re–apparently that they use, the copout that they’re–basically they should–whatever the situation may be, they shouldn’t be allowed to just pull the trigger that easy. There’s no reset button on life. It’s another thing being out here firsthand, and it just–I just personally feel a certain type of spirit over me from being out here today, and I just don’t think nobody would ever be able to feel that. And I’m sure even my son feels it. You just couldn’t feel it unless you were out here. At the end of the day, no matter what, and no matter what a person’s opinion is, if you don’t know, this man right here can no longer defend himself. He can no–he has no more opportunities at life. It’s over. And I just feel like it’s unfair to him and it’s unfair for people to pass judgment on the situation in a negative light, because he’s not here to defend himself, whereas the officer is wherever he is. Even if he’s reflecting on it or whatever the situation may be, that’s an opportunity that he has that Michael Brown didn’t have. HAFIZ: From Ferguson, Missouri, this is Jihan Hafiz for The Real News Network.